Article led by Bradley Adams with additional contributions by A D Ogutu, Saloni Gajjar, & Sam Dinsmoor. Article edited by Donna Cromeans (@DJRiter). Article prepared for publication by Aimee Hicks. It was long since established that The Americans is not a spy show that happens to center on a married couple. It’s a series about marriage and family that happens to feature spies. At the heart of it are Philip and Elizabeth Jennings (Matthew Rhys and Keri Russell), who ground the series, and whose familiarity instantly resonates. Few will have committed murder and espionage in any stretch, but most will have experienced dilemmas in their relationships and everyday life issues. Elizabeth is not like her husband. While Philip is committed to his cause, he also experiences doubt and has as much of a moral compass as an illegal Soviet spy can. Elizabeth is willing to die for her cause — for much of the sixth and final season, she even keeps a cyanide pill on her — and is as anti-American as you can get. But by the time the series finale, START (6x10), comes around, that goes out of the window. What shines through instead is her lesser spotted humanity, her love for her family and her desire to wriggle her way out of a scenario where the alternatives to running are incarceration or death. At the end of two decades of work for her country, suddenly, nothing is more important than escaping the FBI with her family intact. Throughout the series, but especially in this finale, Russell is exceptional in understanding and portraying how Elizabeth is feeling at any given moment. Her performance has rightly earned her the title SpoilerTV Staff Choice Performer of the Month for May. Russell’s first scene is simple, but her trepidation as she walks down the street sets the episode’s tempo. For once, Elizabeth is nervous. The FBI could be anywhere to catch her, and, in an instant, her life could collapse. Even as she tries to look as natural as possible, her eyes cannot help but glance back and forth to check she isn’t being followed. As Russell strides, her mouth slightly open in concern, her character cannot possibly prepare for what comes next. When we next see Elizabeth, there’s an emptiness to her. As she stares out of the car window, her recent actions begin to hit her. A theme emerges: Elizabeth’s remorse. In her thousand-yard stare, Russell captures the regret her character has for doing some of the awful things she’s done. Her reluctance to leave Henry behind only enhances this. Russell’s look is one of disgust — after all this time, it appears to be at herself, and it’s glorious. When she and Philip go to get Paige (Holly Taylor), Elizabeth switches from questioning the choice to leave Henry, to helping convince her daughter that it’s the right decision. What follows is a blend of desperation, frustration, and sadness. There’s a sense of exhaustion to her speech — Russell’s tone is enhanced by the editing, which sees a series of quick cuts — and even a hint of disappointment as she acknowledges that fact. Just a few seconds later, Russell keeps her head turned away as Paige asks about Henry. It’s smart from a character perspective to shift the initial explanation onto Philip, and great from an acting perspective to simultaneously hide and show for the world the Elizabeth’s guilt. The charade continues when pointing out that Henry is almost the same age as her when she began working. With that comment comes a raise of her eyebrows and a lift in tone; false confidence is one hell of a thing. With it, Russell, just for a moment, makes Elizabeth look convinced by the idea. But, as she glares, straight-faced, at her daughter before averting her gaze as she says she loves Henry, we see she knows Paige is right. And then comes her brief emotional outburst, as she is reminded of what a terrible decision this will be. Russell’s expression is enough to induce nightmares. For a show that has been running on twists and turns with rapid-fire types of scenes since season one, what comes next was quite the roller coaster of emotions. This scene went on for eleven minutes, and in reality, was the ultimate confrontation that every viewer has been waiting for since Stan (Noah Emmerich) and Philip became friends. We see Elizabeth, Philip and Paige walk into the garage where their getaway car was parked. Russell positions herself instantly in an angle of protection for Paige as soon as Stan shouts at them to stop. The choice to do this puts Russell closest to the drivers' side of the car but also gives her a sort of a one hundred-eighty degrees view of Stan, Philip, and Paige. This is a situation that could quickly get out of control and requires quick thinking from both Philip and her. Elizabeth proceeds to ask Stan what was going on, but with a soft, familiar tone. Russell’s choice to speak calmly is to reassure Stan that Philip and Elizabeth were not a threat to him. Russell also doesn’t say much, but her body language is clear that Elizabeth understands the feelings of betrayal going through Stan’s mind so, she lets Philip take the lead in responding to Stan's questions. When Philip begins to confess to Stan, Elizabeth interjects to lie that they never killed civilians. Russell leans her head towards Stan as she says this to come off as sincere. While Philip is doing his monologue, Russell then shifts her body and with her eye movement, puts viewers on edge wondering if Elizabeth might try to escape and let Philip take the fall for this mess. Elizabeth is also keeping an eye on Paige, and subtly sends her signs on when to answer Stan’s questions. Philip informs Stan that they were going to leave Henry behind and Russell's emotions come through. The viewer can see the change from resigned to fear in Elizabeth’s eyes. Russell continues to look at Emmerich, and the pain in her eyes makes Stan rethink about not letting them go. The intensity increased as the Jennings got into the car to drive off. Elizabeth continued to stay alert as she drove off passed Stan, but Russell's facial expression clearly showed how sorry she was their alternate life caused Stan and Philip their friendship. As the Jennings drive away from Stan, Russell continues to put up a strong facade as Elizabeth explains to Paige of their plan to get out of the country without Henry. This exchange between mother and daughter was heartbreaking to watch. Elizabeth avoided Paige’s eyes as she tried to explain why it was not going to be possible to see Henry, but Paige's insistence nudged at her. She convinces Philip to at least have a phone call with their son. The Jennings then proceed to a forest to bury their past and a few things that they loved the most. This scene, which symbolized a funeral, was Russell at some of her very best. Elizabeth carried the weight and heartache of her family members as she put all the belongings they were leaving behind in a hole. This was a tough decision for Elizabeth and Russell portrays this perfectly as she lingers on Henry’s passport and stares at his picture. For a mother, leaving behind a child was not something that one would do lightly, and Russell ensured that Elizabeth’s emotions showed this heartbreak. She and Holly Taylor had developed a great relationship over the years such that when Paige declined to speak to Henry, Elizabeth understood and did not push her to talk. Elizabeth stood back while Philip chatted to Henry and through Russell’s expression; Elizabeth’s agony over the decision to not take the boy with them was quite visible. Russell is trying so hard to restrain her emotions here and it plays beautifully. Even her final goodbye to Henry is so simple, “I love you, Henry.” Yet, he doesn’t even know it’s goodbye, which makes their conversation even more poignant. Elizabeth is really staying strong for the team here. The heartbreak is evident on her facial features and in how tensed her body appears. This is not an easy task for Elizabeth and Russell makes sure the audience is very aware of the pain Elizabeth is experiencing. Russell doesn’t miss a beat. This next scene is symbolic because the audience is aware that in a few short years, the Soviet Union will get its first McDonalds. Ironically, it’s the backdrop of Elizabeth and Philip’s conversation as they wait in the car and discuss whether Philip should try and stay behind for a year to keep an eye on Henry. As always, Russell’s face does the speaking for her with minimal dialogue. In what will go down the most heartbreaking moments of The Americans, Elizabeth breathes a sigh of relief that the border patrol officer did not catch them after checking their passports. Her relief is short-lived because she then sees Paige on the station outside, realizing her daughter has voluntarily abandoned them to stay behind in America. Russell had a gigantic responsibility here, to deliver her character’s shock and grief but still contain it within her and not break down. Elizabeth’s crestfallen face as she stares at Paige, grasping on the window for a final look at her followed by an almost robotic straight face as tears stream out, is probably Russell’s best work on the show. The intensity of this scene is elevated by the perfectly timed use of U2’s “With or Without You.” For this scene alone, Russell deserves the Emmy. Over the course of the show, Russell has been navigating the waters of balancing being both a spy and a mother and has been doing so flawlessly. But in this final episode she showcased this struggle more than ever. Her demonstration of Elizabeth’s heartbreak at the realization of now facing life without her children is phenomenal. In a dream on an airplane, Russell transports Elizabeth back in time for a fleeting moment between her and Gregory, a man with whom she once found comfort. The ease with which Russell has Elizabeth slip into this calming position with Gregory, showing her need to remove herself from the situation she faces in the real world and desire to go back to a simpler time, is wonderfully done. When Elizabeth says she doesn’t want a kid anyway, the longing looks on Russell’s face as she observes the beautiful paintings in the room say otherwise. When Gregory disappears, and she’s left with just a painting of her children, Russell brilliantly drops Elizabeth’s tough exterior to show the heartbreak over losing her children that is truly lying underneath. As she wakes from this dream and comes back to reality, Russell has her normally tough and independent character virtually reach out to Philip. He is the only other one who knows exactly what she’s going through, and she seeks his reaction or perhaps some amount of reassurance. But, he is just staring solemnly at the window, alone in his mind. Russell captures the perfect amount of pity for herself and sympathy for him. Russell’s face makes you feel the great deal of sadness washing over Elizabeth at her realization of how much she really loves her children and will miss them. As the Jennings arrive at the Russian border, Russell’s thousand-yard stare returns. But this time it is less out of emptiness than it is out of sheer shock. After all this time, and after all they have experienced, they have finally, miraculously, made it home. Elizabeth looks something akin to scared; for all she’s ever wanted was to get out of the United States. The reality of being home takes a moment to sink in. Russell grasps how monumental a moment this is and treats it appropriately. After a moment of hesitation, in which both she and the audience can breathe, she drives up to the barrier. Even as she explains — soundlessly — her and Philip’s return, Russell’s expression remains serious. Finally, she can rest. And after a long car journey, no better a way was there to conclude The Americans than with Philip and Elizabeth, free to finally be themselves, overlooking Moscow. As they drink in the view of their home city, standing with their backs to the Seven Sisters, Russell displays Elizabeth’s awe. Absence makes the heart grow fonder and there is little she has wanted more than to return to this place, to see what it has become while she has been thousands of miles away. Then, after Philip recounts his story from being given the assignment, Russell gulps before letting her mind wander to curiosity over futures that will never happen. As Elizabeth realizes that Paige and Henry are probably better off not being here, there’s a glimmer of happiness in her expression. For years Elizabeth was insistent that they needed to be together as a family and they’d leave as one if they had to; now, she sees the reality. “They’ll be okay,” she eventually says. There is no false confidence this time: Russell delivers the line with the conviction of a woman who genuinely believes the words she’s uttering. Philip’s response — that they’ll remember their parents and they’re not kids anymore — elicits a hasty, very slight nod of her head. The anguish begins to shine through once again, and Russell’s pained expression returns. It remains, too, until she delivers the final line of the series, in Russian: “We’ll get used to it.” With it seems to come an internal recognition that while accepting leaving their children will be hard, it’s something they can deal with. Russell finds just the right amount of sentiment in her words; it’s fitting, too, that she gets the final words, for she has been such a powerhouse of an actress — and Elizabeth as a character — across these six seasons. 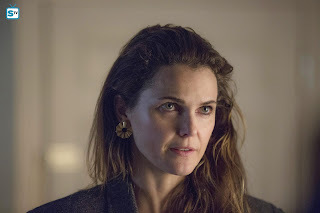 Keri Russell might have come to popularity on Felicity, but it is The Americans on which she has become one of the best performers on television. Elizabeth Jennings has been a wonderful character on a terrific show, stealing the limelight virtually every time she appears on screen and thrilling viewers with her complexities. It’s an absurdity that she is yet to win one of the major awards for her performance, because she is fully deserving of them. This article has looked at some of her finest moments of the series finale, but there are sure to be some that were overlooked, and we encourage you to discuss them in the comments below.